The ship has been working its way back eastward through the islands, and today was our last stop, at the southwestern corner of the Big Island, along the Kona Coast. As with yesterday, we took a snorkel trip on a sailing catamaran to some lava formations just off the coast, where a coral reef will doubtless be someday. Hawaii, as big as it is, is also extremely young as islands go, and may not be much more than a million years old. It may be younger than that, in factand it's slightly weird to think it might be younger than homo sapiens itself. The big deal today was our night pass around the southeast coast of the Big Island, where molten lava from Kilauea still runs from a vent on the side of the volcano down to the sea, as it has been doing since 1982. It took some time to get there, but by 11:30 PM we were about two miles off the coastline, and seeing an intermittent red-orange river that stood out as the only visible thing in a field of inky blackness that embraced both the sky and the sea. Everybody tried to get photos and nobody managed, at least with digital cameras. Jerry has a Canon Rebel with a fast lens, but his light meter told him it would take a 15-second exposure to get something useful, and that's a non-starter on a moving boat. I did manage to see the lava flow in the LCD viewfinder of my Canon Elura camcorder, but the Elura has been malfunctioning and I don't think the image, meager as it was, recorded on the tape at all. Once we have reasonably priced 4 GB compact flash cards, there won't be a lot of reason to use magnetic tape in camcorders anymore, and that will eliminate a lot of mechanical complexity and a great many failure points. In the meantime, we have left Hawaii and are now back on the open sea, steaming eastward on the five-day trip home. We're leaning into a near-gale (force 7) wind, and everybody's expecting a slightly slower and fairly choppy passage back to San Diego. I've got a snootful of meclazine and will probably not be as boundlessly creative as I'd like to be over the next few days, but the chance to simply relax is unusual and much appreciated. 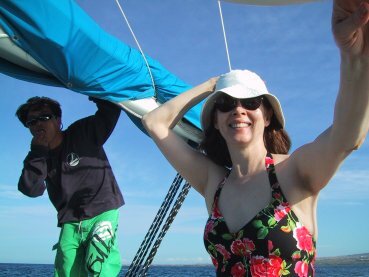 Today we went down to old Maui, and Carol and I hopped on a big catamaran for a snorkeling trip across the channel to the edge of the island of Lanai. 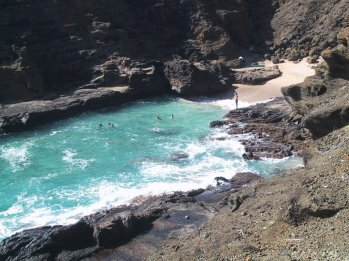 Lanai is entirely owned by a hotel chain and is inhabited solely by resort employees, but this also means that the waters around the island are relatively undisturbed and excellent for watching fish. The weather was superb today, warm and crystal clear without a great deal of wind. The 75 degree water itself felt great after a hot hour's trip across the channel in an open boat, and we jumped into 40-foot waters so clear it was difficult to believe that the bottom was that far downat least until I tried diving to reach an old anchor that had been abandoned on the ocean floor. I know how to clear my ears and have probably done free dives down to 25 or 30 feet as a younger man, but even at that depth, the anchor didn't look a great deal closer, so I didn't push my limits. Close in to shore from the big cat's anchorage were some gorgeous reefs with plenty of interesting fish, though not as many as we saw in the Cayman Islands and some other parts of the Caribbean. We saw our old friends the parrot fish cruising slowly along the reef, pausing now and then to take bites out of the coral. You may not know that this is how white sand is formed: Parrot fish (and a few other species) take little nips from the coral with their sharp beak-like lips, and after digesting whatever organic material came in, excrete the little fragments of coral as grains of "sand." Yup, you got it: Tropical sand is, for the most part, parrot fish poop. Coming back across the channel, we happened upon a couple of pods of dolphins, which followed us for more than a mile before vanishing. 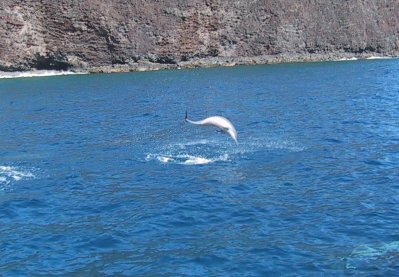 There must have been twenty or thirty, including both the familiar bottlenose species and the rarer spinner dolphins, so named because they jump out of the water and spin through the air, reminding us of skaters doing triple axels. I must have taken twelve or fifteen shots with my Canon Elph before getting the photo at right. Latency in digital cameras is a serious problem if you're trying to get any kind of action shot. Mostly what I got were splashes, sans dolphins, and I only got this one because he did the leap a second or so after another dolphin that I had pushed the button to capture. Not long before we got back to the marina on Maui, an older woman who hadn't listened to instructions and was still wearing hard-soled shoes lost her balance and stomped pretty hard on the toes of my left foot, which is where I sustained some significant damage about a month ago. I wanted to scream, but there wasn't much much to be done but clench my teeth and mutter "It's no big deal" when she apologized. I applaud older people for not giving in to their infirmities, but there comes a time when you have to ask yourself some hard questions about what sorts of activities you can safely partake in without being a hazard to yourself and others. I spent the rest of the afternoon back on the ship with a baggie full of ice on my bad foot, reading Colin Wilson's excellent Poltergeist. One of these days, I may even stop limping. If it's Sunday, this must be Kauai. We're already there and gone. 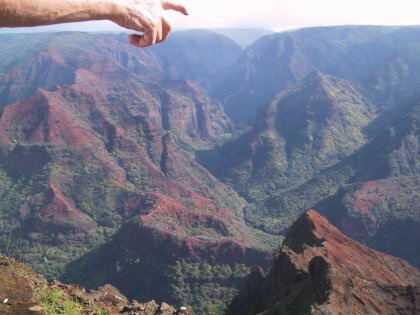 This was a short stop, with morning excursions only, and we took a bus up to Waimea Canyon, the "Grand Canyon of the Pacific," which is an extremely impressivehey, we're on an island!erosion gash across the island highlands. It's ten miles long and 2,857 feet deep at its deepest point, and wins the prize on this trip for the least-expected scenic wonder. The problem, of course, is that we're using to thinking of islands as little tiny things, like the ones you see in the movies, forgetting that Greenland is an island too. The islands of Hawaii are pretty big as islands go, and there's plenty of room for a few canyons. The photo shown here is a favorite of mine. The instant the shutter clicked, an elderly man leaning on the guardrail beside me decided to reach out and point to something. So (as Carol put it) we captured the sense of Divine Creation: Let there be canyon! Later in the afternoon, we pulled away from the cruise ship terminal, and as we moved away from island, the ship did a sunset pass along the Na Pali Coast. This is the uninhabited northwest side of the island, now a state park, where lava cliffs rise abruptly from the ocean to heights of almst 3,000 feet. In the photo here, I pulled back a little bit to give you a sense for the environment from which we saw the cliffs. 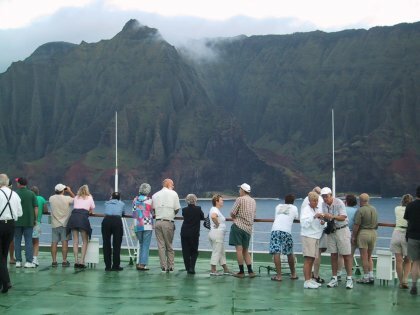 We cruised slowly past them, first from one side of the ship and theneven more closelyfrom the other side, and we understood why Na Pali is a favorite of filmmakers, especially those doing something like Jurassic Park. This is the windward side of the island, and therefore the wet side, and at the base of the cliffs and in through the narrow, razor-gash valleys is impenetrable rain forest. The Na Pali coast is one of the few things that can be "done" better from a cruise ship than in person, trying to pick your way along the narrow beaches at the foot of the cliffs. I'd certainly like to return and perhaps ocean kayak from the resort at the southern edge of Na Pali, but there was not be a view as big (nor as comfortable) as ours was today. The Internet connection here on the ship is currently down, but I'll take a few notes here and post them when the network comes back on. We headed out this morning for a more ambitious bus ride around the edges of Oahu, with several sightseeing and "likiliki" stops (sound it out) ending up at the Polynesian Cultural Center, which is an enormous complex focusing on the history and culture of the various peoples of the Polynesian Islands. This was less interesting than I had hoped, and in truth we weren't there for very long, and had to elbow past an army of Japanese tourists who all arrived at once. We sat in on some interesting sessions, including a superb one on the various musical instruments developed by the Hawaiians, including the ukulele and the steel guitar. 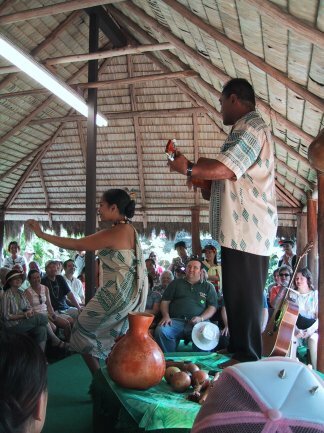 The ukulele comes from two Hawaiian words: "uku" (head lice) and "lele" (jumping) and as it was explained to us, when you scratch your head, the uku start jumping aroundand when you "scratch" (play) a ukulele, the notes start jumping around like head lice. Well, maybe you just had to be there. Certainly the guy giving the lecture was an ace with a ukulele, and pretty fair with a conch shell as well. We saw some other short sessions, and part of a canoe pageant, but with a only a few hours to fight the huge crowds, most of it was left unseen. The best part of the excursion, in fact, was a scan past the beaches of Oahu, which made my mouth water, and I'm not even a surfer. We are just going to have to come back and do them in detail. And in the meantime, I have to get to bed. The ship is off to Kauai tomorrow, and another early bus trip, this time to see the Grand Canyon of the Pacific and the famous Na Pali coast. More as it happens. Breakfast on the Statendam might well be characterized as "The Race for the Raisin Bran." In a rack of six different cereals it's always the first one to go, and if you get up to breakfast much past 8:00 AM, you might as well just reach for Cheerios, unless you're lucky and someone has fumbled a box over the top and behind the cereal box rack. I don't ordinarily eat Raisin Bran, but then again, I don't usually live on restaurant food (as we have here on shipboard) for days at a time either, so Raisin Bran helps a lot with, um, certain issues. Alas, most of the other people on board have these issues worse than I do, and while All Bran is present in quantity, All Bran looks and tastes like clotted sawdust. You would think the cruise line would pick up on this and put two rows of Raisin Bran on the cereal rack, but no: They insist on racking up Fruit Loops, and what retiree in his right mind eats Fruit Loops? Having docked at Honolulu this morning before dawn, today was an early-out day, and although I didn't get a long night's sleep, I did get my Raisin Bran. Carol, Bill, and Jerry have gone off to the Pearl Harbor tour. Gretchen and I were of one mind about this: No war memorials. Observing the brutalities of the current day is heartbreaking enough; being vividly reminded of the deadliest war in human history was something neither of us was willing to do. I can read the history of WWII, but I can't assimilate too much of the images, the relics, the sounds, or the videos without getting very depressed. No other war affects me that way, and I really can't explain why this one does, but the strength of my conviction may be derived from the fact that I sent Carol off without me, and I hate to be without her, even for a few hours. Instead, Gretchen and I took the four-hour bus tour around the eastern end of Oahu. Today's weather was as perfect as yesterday's was lousy, with brilliant sun and temps in the low 80s. We hugged the coast and went past Waikiki beach, the absolutely gorgeous flooded caldera called Hanauma Bay, Sandy Beach, Makapuu Beach, and the tiny (maybe thirty feet wide) beach (left) called Here to Eternity Beach because a scene from the classic film was done there. We then angled back west over the mountain ridge that separates the windward and leeward sides of Oahu, and did a few loops through Honolulu to see the state capitol and other famous buildings before heading back to the ship only a little after lunchtime. I'm generally not much for bus tours, but this one was necessary reconnaisance for a future trip back here in a year or so. In the meantime, I could use a nap. Yup, I could use one, but something in me simply does not sleep during the daytime. So I suspect I'll go sit up and read by the ship's pool until Carol gets home and we can plan the rest of our day. 8:30 AM: We're pulling toward Hilo, now about a mile off the bow, and will be docked by 10:00. It's a drizzly, tropical sort of day, about 80 degrees and mostly overcast. Right after lunch we'll be hopping a bus to Volcanoes National Park, and while my bum foot will keep me from doing the lava hike, both Bill and Jerry will be out there, taking pictures of molten lava. Carol and I discovered after we woke up that our cell phones work again, after four days of that glum "No service" indicator. So we called the family back in Crystal Lake, Illinois, and wished them all a happy Thanksgivingand judging by the numbers of other cell phones on deck here, we weren't the only ones to get the idea. Even though the ship is no longer heaving on ocean swells, I still feel the motion. Fortunately, my breakfast doesn't, and my breakfast is the one I trust in such matters. Anyway, I need to post this before we disembark. I'll try and provide an update to this entry later on this evening, after we get back. 5:00 PM: Just got back from our Volcanoes National Park bus tour. No molten lava was to be seen this time out, even by Bill and Jerry, who took the long hike down into one of the several craters on Kilauea where lava can sometimes be seen. On the other hand, not seeing molten lava is a little like not encountering a grizzly bear on a hike: No matter how disappointed you may be, a part of you remains treasonously thankful. The day was overcast and drippy, and Carol and I had to dash back to the bus to avoid a cloudburst while standing on a relatively recent (1984) lava field . We did go through the Thurston Lava Tube, which was in the middle of a rain forest and seemed delightfully Indiana Jones-ish, though so dark inside my poor digital camera recorded little of it. Most of the best sights were had along the Crater Rim Drive, though the mist and rain made the quality of my long-distance photos poor. We spotted yellow sulfur deposits at the bottom of the Kilauea caldera, with smoking crevasses on every side. 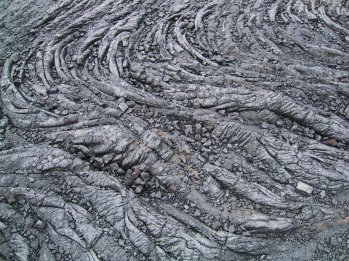 The transition from rain forest to surface-of-the-Moon lava devastation (see photo above) was startlingly abrupt, and I was wishing for additional time (and a healed foot) to see more than what I caught with my nose pressed up against a bus window. I learned last night that they will be working on the ship's Internet systems starting tomorrow, so I may not be able to post new entries after this one, or respond to email, until November 30. No entry yesterday. I was, um, waiting for the flash drive containing all my Web files to dry out. I washed it, in the pocket of my jeans, on which I spilled some chocolate syrup yesterday afternoon. So the jeans went into the little self-serve laundry on A deck, and it wasn't until they were hanging up to dry that I remembered that the 256 MB Cruzer Mini drive was still in the change pocket. Erk. Marvelously, the drive still works, though I'm going to keep an eye on it for the next few weeks. In truth, there's not a great deal to report. 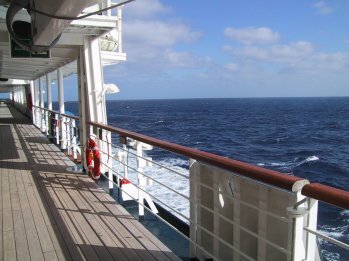 Cruise ship life "at sea" is mostly sleep, walking around the teak track on the promenade deck (see the photo in my November 22 entry), playing Team Trivia, reading books, and soaking in the Jacuzzi. We're certainly enjoying it, but there's little more to be said about it than that. I have already finished one book and most of a second. They represent an interesting piece of literary dissonance: Margaret Webster's A New Strength, a New Song, which is about the struggle of women to become priests in the Church of England; and Hitler's Flying Saucers by Henry Stevens, which is pretty much self-explanatory. As I think I've mentioned here and elsewhere, if there really are UFOs, they're not aliens but Air Force. If that includes some sort of heretofore unknown means of propulsion, so much the better, but the fascinating thing about flying saucers is speculating what could be done with the sorts of physics we have right now. People have played around with jet turbines five or six meters in diameter, turning vanes that throw down enough air to allow a circular vehicle to hover. Such a saucer is basically a very short, very wide jet engine with a pilot in the middle. These have demonstrated utterly horrid fuel efficiency, and won't replace helicopters any time soon, but you gotta grant them a certain contrarian cool factor. The main is bounding a lot less as we thread our way southward and westward, and people are in good spirits again. In fact, Carol and I found it difficult to get a spot in line for breakfast this morning, clearly indicating that people who spent most of yesterday flat on their backs in their bunks are rejoining the party. The Internet connection is a little quirky, and very slow (not even dialup rate, especially on upload) but it's been enough to keep email coming and going and Contra current. We did another couple of miles on the teak track around the promenade deck, with bright sun on the water and that unfamiliar (to Coloradans, at least) salt smell in the air. We didn't "do" much today, and that was just the point: We walked, we did a short brisk stint on the treadmills in the gym (which required hanging onto the handgrips, something I almost never do) and we hung out with Gretchen, Bill, and Jerry. I miss my little sister, and it never fails to surprise me on spending any laid-back, unstructured time with her how completely similar we grew up to be, even though in childhood I often suspected that our parents had gotten at least one of us (which one was was subject to heated debate) from the gypsies. 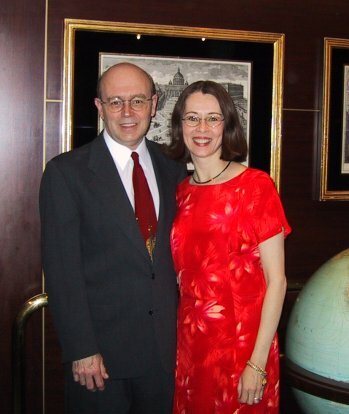 Last night was our first formal night at dinner, at which everyone is required to dress up. Bill and Jerry even brought their own tuxedos, something which is a little beyond the line I draw on such things. (I wear a tie maybe once a year.) Carol wore her marvelous Hawaiian dress that she bought for our 25th wedding anniversary, and we toasted one another over dinner while reflecting that we as a group are among the youngest people here. We've spotted one younger family with a toddler, and two pre-teen children, but virtually everyone is 60+. We talked to one gentleman who is 94 and celebrating his fifth wedding anniversaryto his fourth wife. (As he put it, he buried the first three.) One consequence is that there aren't a lot of vigorous activities on the ship. Some of the cruise lines are now installing things like climbing walls, though not Holland America. That's a shame; I'd like to try a climbing wall, and with the current crowd, at least, I suspect I wouldn't have to wait in line. Again, there is something to be said for practicing the art of doing nothing. I don't have a natural talent for that, so I have to work at relaxing, but it's a skill well worth having, if you can summon the courage to develop it. Wi-Fi at sea! I was a little surprised at the sagacity of the Holland America cruise linewhich is known far more for stability, safety, and familiarity than innovationin installing a wireless network throughout the public areas of the ship. Otherwise, you wouldn't be reading this now and would have to wait until we got within e-shouting range of the Internet. The ship has a satellite Internet connection, and will happily sell you connection minutes for a fee ranging from 40 to 55 cents per minutes. Needless to say, I work offline and then connect only to transfer mail and upload Contra entries. Molly has clearly been on a few more cruises than I, who weigh just a hair over 11 stone. 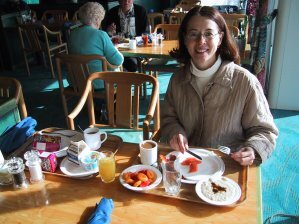 The food is so good that it's tough not to overeat, and it was with an iron will that I sat down to breakfast this morning with little more than a bowl of Raisin Bran, a single naked patty of breakfast sausage, and some strawberry-banana yogurt. You can get fed here almost any time of the day or night at no extra charge. Because dinner is so late (8 PM) we typically eat four meals each day, with taco time at 4:30 or so, and hope we don't end up looking like hobbits. Our only significant problem so far is seasickness. On all our previous cruises we were in quiet coastal waters or the peaceful Carribbean, but now we're in the open ocean, and the ship is major boogeying to get to Hawaii in four days. Faster progress means more rock-n-roll, and we're seeing a fair number of people here looking pretty gray. I got queasy last night about 2 ayem, and Carol (God love her!) got dressed and went searching for seasick pills. One of the ship's staff went and found some for her, and I've been in good shape ever since, though walking around is a little trickier than I recall it on our other cruises. Carol's good Navy genes make her oblivious (her father was a Navy man and generally a tough bird) but I seem to be susceptible, and I'll probably be chomping the little chewable meclizine tabs regularly before we get to Hawaii. Today will be pretty quiet. We're all acclimating, and I don't expect to do much more than read a little and maybe take some notes. That's most of what I want in a vacation, so at this point, all is (unsteadily) well. Sorry for not posting for a few days; we've been getting ready for our first vacation in more than two years. 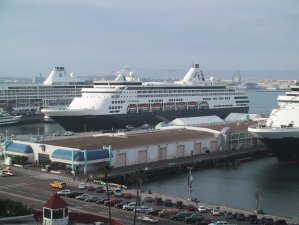 At left is the Holland America cruise ship Statendam, upon which we will embark in about four hours. We got a great hotel room last night at a Holiday Inn across the street from the cruise terminal, on the 12th floor, which allowed me to get some great shots. 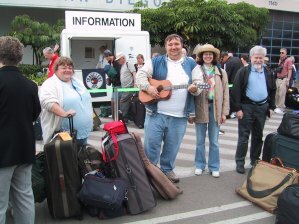 Carol and I will be heading toward Hawaii, and I'll be in the company of my sister Gretchen (a banker, at left in photo) her husband Bill (a programmer; with guitar) and our old friend Jerry Corrigan (a PhD. electrical engineer, right of Carol.) We've done a few cruises now, and we've learned that it's good to have some people along with you who share a certain cultural context and enjoy the art of creative BSing. I expect to have some good conversation, some good wine, and probably more good food than I need. (More on this little issue later on.) We have four days at sea going out, and five coming back, as we thread between Hawaii and the mainland. I'll keep you posted here, assuming the ship's supposed satellite Internet connection actually works, and doesn't cost $100/minute. Otherwise you'll have to wait until I can find a hotspot in Honolulu, or (perish the thought) until we return to San Diego. I've come a long way on the workshop scene. 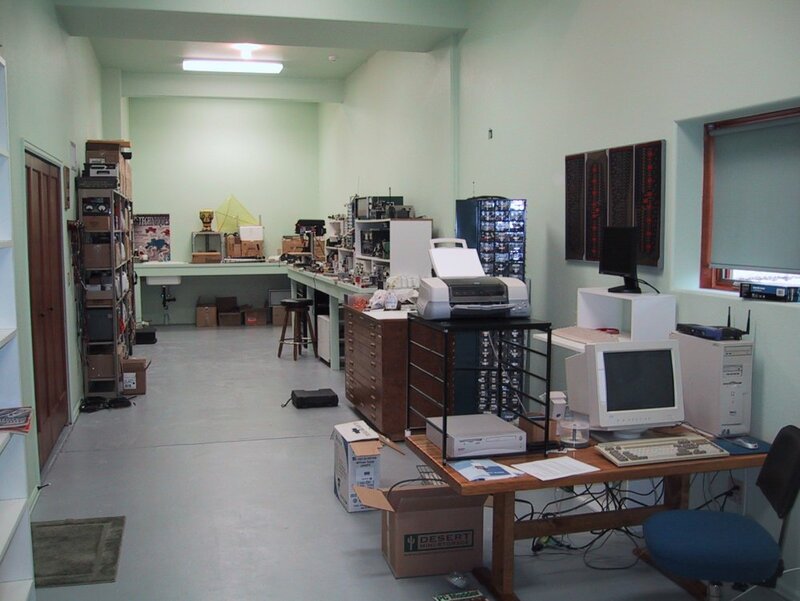 The photo at left is where I did my tinkering circa 1980, on a single 7-foot workbench in the drippy, drafty basement of our house on Susquehanna Road in Rochester, NY. About all I can say for it was that it was right next to where the copper water pipe came through the basement wall, giving me a ground system of a quality that I never had again. Fast forward to 2004. When we designed this house, I carved out an 11-foot sliver of the lower level (it's not really a basement) running the entire 47-foot length of the house. This was deliberate: What I need in a workshop isn't vast empty space so much as lots of linear feet of wall for benches and storage. I have two built-in benches, one 16 feet long and another 11 feet long, with an integral sink. The plugmold running along the big bench has its own circuit, and the bench itself is made of 4 X 4 lumber and will hold a lot of weight. 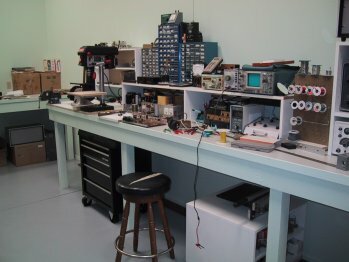 At right is the test bench portion of the big bench, where I actually build things, within reach of all my test equipment. The third of the bench off the right end of the photo is where I keep all my classic radios. Further toward the rear of the house is a new-built server shelf and a computer desk, as well as my technical library. 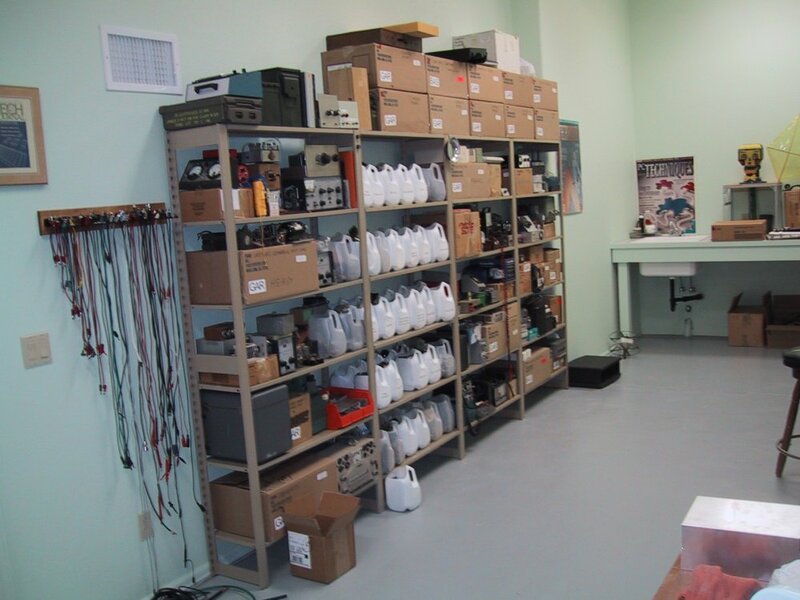 Opposite the big bench are my modular steel shelves, containing my parts inventory and other oddments. I'm not quite done yet. There is a little more shelving to be built, and I still need to find a reading chair to park in the corner beside the door to the back deck. There are still some boxes lying around, and I'm trying to figure out a good way to store wire, cable, and headsets, of which I have a few too manybut it's nice to be able to snag a 2000-ohm, 600-ohm, or 8-ohm headset as required. Rather than blow this entry into my largest ever, I'm parking some additional photo links in the left margin. This one has been a long, long time coming...but in a very satisfying way, my tools, my parts, and I have finally come home. Haven't felt as well as I usually do this last week, so my entries have been a little thin. I cheered myself up some by taking us all down to see The Incredibles at Tinseltown. I had been prepped by all the hype in the papers to be dazzled, and I wasthough expecting to be dazzled takes some of the shine off of being dazzled once the film is actually in front of you. Everybody knows by now what it's about: In a sort of American mythic late-deco 1962, superheros have had their day, and are being driven into government-arranged hiding by the trial lawyers, who are now suing superheroes for "wrongful life" when they rescue suicides. Mr. Incredible, his wife Elastigirl, and their three superkids are reluctantly living the life of normal suburban people. Being a claims clerk in a dastardly insurance company is driving poor pseudonymous Bob Parr bonkers, so he and another super-in-hiding pretend to go bowling while listening to a police scanner and doing some odd supering every other Wednesday. Earlier in his career, Mr. Incredible had given the brush-off to a teenage geek fanboy who styled himself Incrediboy by virtue of home-made rocket boots. Warning: Be good to your fanboys (as I always am, to what few I have) because you never know when they'll grow up to be high-tech supervillains and set out to make your life a little more difficult. If this is all starting to sound a little too familiar, well, you've hit upon the only serious flaw in the film. I know that superheroes are big, and I recognize that I've never been a massive comics fan. I rarely read them as a kid because my parents didn't let me have them (though I sneakily read a few at my cousin Ron's house, he who could have anything he wanted and generally did) and the last series I followed closely was Elfquest, back in the early-mid 1980s. Still, I was anticipating the plot at every turn, which as the film progressed drew less and less on comics and more and more on the James Bond film canon. At some point, giving homage to the past edges into becoming the past, and, well, I've seen most of the Bond films. The Incredibles lacks the warmth of Monsters, Inc. and especially A Bug's Life, which is Pixar's underappreciated masterpiece. It's certainly well-written, funny and fast-paced, with a good jazzy score and an amazing internal consistency of cultural design, evoking how the American culture saw itself in the late 50's and early 60's. The Incredibles' 60s-modern suburban ranch house is quite a piece of architecture all by itself, and no expense was spared in making the comic-book universe hang together. God knows it's universes better than Finding Nemo, which is Pixar's only stinker so far. Its only flaw is that the material has been done to death by Hollywood. The great potential of computer-based animation lies in creating completely new contexts, much as the alternate monsters universe in Monsters, Inc. The Incredibles creates an alternate universe, but I've been there once too often by way of other films. Still, it's a fine evening's entertainment, and I do recommend it. Christmas is coming; the Sunday paper's getting fat...and the goose is being stuffed into the middle of a turkey. And the chicken, well, the chicken's in the middle of everything. I'm talking about a new food fad that's begun to break out of its ethnic Cajun origins: Turducken. Basically, a turducken is a chicken stuffed into the middle of a duck, which is then stuffed into the middle of a turkey. The notoriously juicy (read: fatty) duck serves to moisten up the chicken inside it and the turkey outside it, and with the addition of some hot sausage and some spices (hey, this is Cajun we're talkin'!) the whole thing becomes a sort of poultry ice cream roll, and is reportedly delicious. The duck and the chicken are completely deboned, and the turkey mostly deboned, so that you cut a slice out of the whole assemblage that includes a bit of all three birds, plus the sausage stuffing that separates the duck from the chicken. I wouldn't exactly call it fat-free, but what the hey: Sounds pretty good, especially to a guy who thinks both turkey and chicken are way drier than they should be. We used to have duck a lot when I was a kid, and it was a lot greasier than I would have liked, so turducken is in fact a way to meet in the middle. From what I've heard, turducken is extremely stylish this year, so watch your Sunday paper for an article on how to do it. Lotsa work, by the wayhave you ever tried to debone a chicken?but it sounds like it should be well worthwhile. I have finally declared my new workshop functional, if not quite utterly complete, and actually spent some time there on my ratty old bar stool the other night, piecing together a new breadboard lashup for perfecting 12V space charge tube circuits. A number of things remain to be done (like creating my attic antenna farm, from which there is a nice 1" conduit down to the workshop) but it was a wonderful feeling to actually take up a soldering iron again, after a lapse of almost two years. I need to take some photos and will post them soon. Some years ago, I used to have a simple freeware utility that would periodically go up and take a length value (or maybe a checksum, I don't recall) of a Web page, and compare it to an earlier value. If it detected a change it would pop up with a message. I don't remember its name, or what this category of software gadget is called, but if you have such a utility and like it, send me a note with a pointer. Another utility I would like to find is a keyboard interceptor that will block Ctrl-A, which is the speed typists' worst enemy. Is there anything out there? 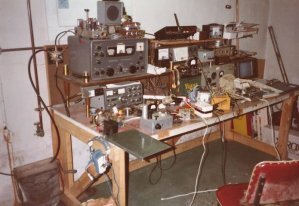 Almost on impulse (actually, more like the fact that I have a workshop again) I decided to return to a project I had contemplated back in the late 1960s, when I was given a completed Heathkit FM tuner but had no amp to run it into. I had a book back then called the GE Hobby Manual, which was really a set of simple projects built around GE semiconductors and a few tubes, especially GE's Compactron line. One of the more ambitious projects was a 2-watt stereo amplifier using a pair of GE 6T9 Compactron triode-pentode combos. I couldn't afford the output transformers back then or I might have built it, but hey, better late than never. I'll report on the project's progress as it goes. I'm in no hurry, and would like to do it right. Carol and I have begun seeing trailers for a new animated film, Robots, by the people who made Ice Age. It shows promise, at least to me, a guy who likes robots and robot movies, especially the inexplicably under-appreciated Iron Giant. In fact, the young robot protagonist of Robots looks a lot like a teen version of the Iron Giant himself, and hooks up with a robot con man voiced by Robin Williams, who then have adventures in techno-baroque Robot City. Few other details are available, but I'm looking forward to its release in March of next year. Finally, Bret Stephens wrote a short piece in the Wall Street Journal, describing two different experiments in which journalists wore Bush T-shirts and buttons in Kerry country, and Kerry T-shirts and buttons in Bush country, right on the eve of the election. The reporters who wore Bush paraphernalia in Blue Places got swore at, spat on, and abused to just short of physical assault. The reporters who wore Kerry stuff in Red Places were politely ignored. There's nothing much I can say to add to that. This time, American politics pretty much spoke for itself. I keep about 5% of my books unread; that is, I always try to have a significant number of books on the shelf (at least 100) that I haven't read yet, so I can always pick something to suit my mood when I need mood-suiting. 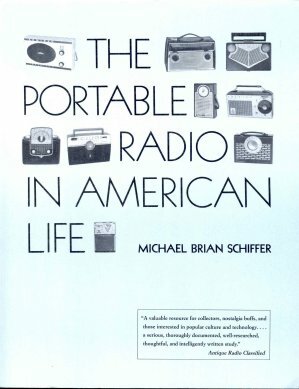 In the wake of my September 23, 2004 entry on the primordial Regency TR-1 transistor radio, I went to the unread pile and chose The Portable Radio in American Life by Michael Brian Schiffer. I got it in a discard pile somewhere, probably for $5 or so, and because it looked a little like a gussied-up doctoral thesis published by the University of Arizona Press, I didn't expect much. I was wrong. This is a fine, fine book, which is basically a history of the American radio industry from the crystal set to the demise of American radio manufacturing in the face of cheap Japanese and Taiwanese portables of the 1980s. The focus is on the place that small and eventually portable and ultimately pocket radios had in the American psyche, and how they mutated along with American tastes for electronic entertainment. It's easy to forget (as the old folks who lived the early radio era leave us) that until the arrival of TV, radio was listened tonot just played in the background. Radio used to be a lot like NPR, with mostly spoken programming and high-browor at least broad-browmusic. The change was precipitated in the late 50s by portable radios, first "lunch box" tube portables and later transistor pocket radios, which were given to teens so that they could listen to their "damned &#! * noise" in their own rooms or while they were with friends. Following this ravenous teen market for radios came the teen-focus stations that soon tossed "wholesome" music and talk programming overboard in favor of all-rock, all the time. By 1960, there were two completely different radio markets, one for adults, and another for teens, and by the mid-1980s, with FM in the saddle and playing mostly rock music in its many niches, AM radio morphed again, this time back to sports and talk. The writing is engaging, even though the author uses ugly coinages like "techno-mancer" that made me wince each time he used them. Although published in 1991, the book is still in print and available from Amazon. Highly recommended. Fellow tube freak Brad Thompson sent me a pointer to an article in USA Today describing an Air Force research project aimed at developing psychic teleportation; basically, "Don't bother, Scotty; I'll beam myself up." The project was published on the Federation of American Scientists Web site, and can be downloaded in PDF form here. It's a pretty dense read, full of equations and research-speak, and I may be some time digesting it. There are loads of conversation seeds in this one little item, including whether the Air Force should be spending millions of dollars trying to militarize...miracles. That's basically what they're doing, and I had to laugh a little. About ten years ago I began a whimsical and slightly snotty SF/fantasy novel called Rapture, about a group of eccentric Irish monks who perfect purely mental teleportation, and teleport themselves to Tau Ceti II after the emissaries of the Pope tried to strong-arm them under the Roman yoke during the Synod of Whitby in 664 AD. The monks refer to themselves as the Brothers of the Unfolding Mystery of Creation, or The Unfoldings for short. One of the monks, Jimmy-John O'Bannon, explains to the viewpont character that they specialize in "theological physics." Teleportation is of course their best trick, but they had numerous others (including zero-point energy and talking to angels) and the book was great good fun until I realized it had no audience. Between the lines, I was slyly ridiculing the Millerites, a bunch of obnoxious fringe Christians who twist Scripture into something that powerfully resembles New Age weirdness, eventually giving us the Left Behind nonsense that is the right-wing bookstore equivalent to The Da Vinci Code. Needless to say, the Millerites wouldn't read the book, and liberal Christians don't much believe in the supernatural, especially if the supernatural appears to impinge upon "hard physical reality." So I dropped it into the trunk and haven't looked at it since 1995. The supernatural was long the province of the Catholic Church, and it wasn't until the Second Vatican Council that miracles and their associated prayers, legends, and devotions went into shadow, from which they have yet to emerge. It would be divinely ironic if the United States Air Force succeeded in systematizing "thological physics"and even more ironic if making theological physics work required a certain, um, prayerful mindset that prevented its use in military action. Sounds like yet another novel to me, but I'm pretty sure I don't have to worry about Tom Clancy writing it before I do! From the "how the hell could this be?" department comes the revelation from Reuters that BitTorrent file transfers now account for 35% of all bandwidth used by the global Internet. 35% on one file transfer protocol! It is to boggle. I downloaded the spyware-free open-source Shareaza program (which supports the BitTorrent protocol) and tried it out. The results were not promising: I was not able to download anything but relatively small open-source software packages. All the really big stuff was so in demand that anyone who was sharing it was "choked" and bits were barely dribbling in. (Nothing like trying to download a 600 MB Linux distro at 372 bits per second!) Even the little stuff came down very slowly. I routinely get things from Sourceforge at well over 100 KB per second, so there's very little need to use a torrent to get at something the Web will let you have in a fraction of the time, using nothing more than HTTP. Worse, perhaps, is when a whole group of people have parts of a file, but the original full file goes offline before anyone had managed to get the whole thing. The file thus loses its "seed," and after everybody has all the fragments, the download simply stops. BitTorrent is a little tricky to describe. It was developed to distribute very large files (Linux distros, in fact) as quickly as possible. When you download a file using BitTorrent, others who join the torrent "swarm" after you do begin to download from the material that has already arrived on your hard drive. Once you've pulled down a few megabytes, as much material is moving out of your PC as is moving into it. This basically splits the bandwidth burden among all the people who join the swarm, instead of choking a single server from which everyone must download simultaneously. It sounds great in principle, and I'm not sure why it worked so badly for me. I have an intuition that BigMediaPhobia has caused many more people to be downloading than sharing (the classic "leech" problem) but why this should be true for 100% legal material like Linux distributions remains a mystery. Apparently most people are using it to download movies and TV episodes ripped from DVD or encoded (badly) from VHS tapes, and if 35% of the Internet's bandwidth is really being used for BitTorrent file transfers, the movie and TV industries may be in more trouble than we thought. This is all the more remarkable since you can't download a copyrighted movie with BitTorrent and not be culpable of sharing the material with others, since that's how BitTorrent works, and it makes no effort to hide the IP addresses of those partaking of the swarm. That fact, and some evidence that Big Media now has torrent swarmers in their legal crosshairs, makes me recommend against its use for anything but the big open-source files that were its original inspiration. Good grief! I've been slashdotted! Fortunately, it was a piece I wrote for an online magazine and not something here, else you'd hear the legendary sound of servers going down in flames. What was interesting about the item (I'm still grinding through the nearly 400 comments) is that a lot of the commenters didn't read the article, and quite a few appear to have completely misunderstood what I was saying. I am not pimping for Microsoft, and I don't even think I qualify as a "Microsoft enthusiast," though I do confess enthusiasm for the C# language. (In fact, in my recent Degunking book I strongly advised people not to use either of the Outlooks or Internet Explorer.) What I did do is shine a little light on some of the problems with the standard C library, which has always been pretty much inseparable from the C language itself. Yes, there are other ways to code strings in C. I see no indication that anyone is using themand criticizing clib is almost as much a hanging offense as criticizing C itself. I hurt my foot the other night and was out a good part of the day today waiting to get it X-rayed to see if I'd broken anything, and found fifteen or twenty notes in my inbox pertaining to the item when I got home. Wow. Like we used to say in the Sixties: What a rush! A modern sight shows that it takes usually of only 3.7 boozings to make a katzenjammer. But this pills helps you eschew katzenjammers and wake up feeling grand from caput to stomach and all over else. POPFile caught both of these messages, and just about everything else. My long-term POPFile catch rate is about 99.6%. POPFile still needs something I call a "learning magnet": a magnet that pulls a message to the inbox or the spam box, and yet adds the message's words to the corpus. POPFile's current magnets will pull a message but not add the message to the corpus. I could probably do better creating magnets for e-commerce sites that I use (which is why POPFile's accuracy isn't up above 99.7% somewhere) and I'll try to do that when I swap machines later this year for the new one I'm building. In the meantime, 99.6% ain't bad at all. Video is usually the Achilles heel of KVM switching, but I had no trouble or image degradation switching at 1024 X 768, or between one PC at 1024 X 768 and another at 800 X 600. Even at 1280 X 1024 there was no visible banding or ghosting, as there was with my Belkin OmniView. (I should be fair and admit that my lab bench monitor is getting old and doesn't do 1280 X 1024 especially well, even without a switch and abundant cable in the line.) The fine print says that it doesn't work with several lines of laptops, including some Toshiba models and my own IBM Thinkpad X21. 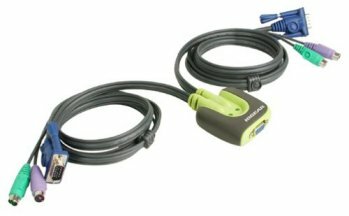 It's really intended for conventional PCs with external I/O. Fry's had it on sale for $39.95, and there were no extra cables to buy. (Amazon sells it for $28.99) Highly recommended. We must get the money out of the election process. A bunch of rich California carpetbaggers invaded Colorado and bought a number of statehouse elections but not the election they wanted most, an initiative that would have split the Colorado electoral vote proportionately among the two parties. Whether we really need the electoral college system is an issue worth discussing, but if we're going to dump it, we have to dump it all at oncealthough I would consider allowing California's 55 electoral votes to be split first. Right, guys? Heh. Didn't think so. I heard voices on both the Democratic and Republican sides muttering that they had to work harder to move the electorate in their direction. Sorry, folks, but it doesn't work that way. Parties, to succeed, must follow the electorate. The electorate never follows a political party. The party that wins does so by virtue of having followed the electorate more closely than its rival. Now let's move on to stuff that's more fun. Clearly, the biggest loser in Tuesday's election was...exit polling. The major news media outlets made total asses of themselves in 2000 by issuing all kinds of projections on insufficient or faulty data, and caught furious flack from the public and both political parties. They were doing their best not to project their own wishes (apart from Fox News, mostly Democratic) onto the slowly-returning precinct totals, and we can all be glad for that. The exit polls were still being taken, however, and the "blogosphere" (god, what an appalling coinage!) had no qualms about using them to predict a Kerry victory early and often. How they got the data is often obscure, but this year it's the bloggers who look like asses, proving yet again (how many times does it have to be proven?) that statistics are really a science, and journalism must play by certain rules to be taken seriously. Exit pollers poll more women than men, not because they prefer women (or want to tilt the results in the Democratic direction narrowly favored by women) but because women are more likely than men to be willing to answer exit poll questions. Republicans tend to keep their political preferences to themselves more than Democrats, who are thus more likely to answer exit poll questions. This maps to my conversations with conservative and liberal friends. In recent months conservative friends tended not to talk about their politics; liberal friends tended to talk about very little else. There is almost no time on election night to do the massaging required to impose some sort of statistical rigor on exit poll results. This means that what is reported is rawvery rawdata. Some people probably lie. I doubt I'm the only one. It's the only way to get back at the pollers, since decking them is rude and illegal in most places. Exit polls are conducted by companies using paid staff, and without someone willing to foot the bill, the polls will not be conducted. Let us hope that this election is the beginning of the end of exit polling, since I'm afraid that we're stuck with the "blogosphere." As I write this, it's early Wednesday morning, and there are still three states in play. However, with both candidates barely within 20 electoral votes of victory, the guy who gets Ohio (and its 20 EVs) gets the prize, and even if one of them gets the remaining 12 electoral votes, that's not quite enough. Poor little Iowa and New Mexico are much less interesting this morning than last night, heh. My prediction yesterday morning still holds, since Bush leads in Ohio by over 120,000 votes. There are supposedly 125,000 absentee and provisional votes still to be counted, and for Kerry to win virtually all of them would have to be his. I don't think so. Time will telland I doubt that even a whole army of lawyers can argue that a worst-case 60,000 vote lead is all due to fraud. More interesting are some of the other demographic issues that surfaced with this election. Bush won Florida by 375,000 votes, and I can't help but see the Star of David in much of that margin. Many (I don't know how many) of the Hispanics in Florida are Cuban by descent and probably supported Bush anyway. The only way I can figure that margin is that many among the heavy Florida Jewish population could no longer abide the anti-semitism rampant on the Democratic fringes. The great astonishment among the results, to me at least, was the fact that Bush won 10% of the Black vote. He got barely 4% in 2000. Against a century of custom, Black church leaders were supporting Bush among their conservative congregations, solely for his opposition to gay marriage. In an election balanced on a razor, losing 5% of the Black vote may well have tipped the balance, and if Bush gets Ohio, I think it's fair to say that his support among conservative Black voters in Ohio handed him the presidency. Nader may have helped a little, but Nader was almost off the radar this year. I think that I was wrong: Gay marriage was a major issue in this election. History may in fact show it as the pivotal issue. It's interesting how this issue crosses conventional political lines. One of the most liberal women I know quit her Quaker meeting because it demanded that she endorse gay marriage, and she would not "stand down" (give ground). I tend to dismiss cultural issues in elections, since cultural issues rarely excite the Muscular Middle. Sexual morality as a political issue does little or nothing for me, since I'm very leery of legislating sexual issues. I'm a powerful believer in monogamy and marriage, and if I had to take a general position, I'd say that it's up to government to establish a morally neutral legal framework within which personal morality has an opportunity to flourish. How far this framework must expand to accomodate the demands of society is the key issue, and I have no crisp position therebut clearly, a lot of Americans do. The rest of the national returns suggest something I've seen for the last ten years or so: The slow erosion of the Democratic Party, caused by its refusal to tell its own fringes where to get off. Once the Republicans get a 10-seat majority in the Senate, the game is over, since we're now ruled by the judges that the Senate confirms. Government by judiciary has always been a Democratic Party obsession, and I think that in another ten years or so, they will be seriously regretting it. My notefile has a couple of additional issues pertinent to the election that I'll address in the next couple of days, but I admit that I am mortally weary of politics and will be very glad to set it aside for another four years. Mid-day update: Kerry has gracefully conceded the election, proving what most of us suspected: He's a class act, and would probably have won had he bitchslapped any or all of: trial lawyers, teachers' unions, radfems, Black racists, environmental obstructionists, and probably half a dozen more of his extreme-left ratbag of constituencies. Will the Democratic Party learn anything from this? I doubt it. Looking in my nanocrystal ball, I see the 2008 contest as being McCain vs. Clinton (the other one) and the Dems facing off with a reasonable centrist in the Ahnold mold. They would have the chance to respond in kind. Will they? We won't know until then, but I suspect not. There's rarely a returns desk at the soul-selling store, especially for political parties. Well, here we go. I'm predicting a Bush win by a squeaker, but in truth, it's so close that it could go either way. Had Bush not sold his soul to the neocons and started that stupid war, he'd be in by a landslide. Every year, more and more people swim the Tiber from the left to the right, and the all-important middle leans further to the right all the time. People still find it odd that the young are the new conservatives, and as the Boomers start to die in droves, the Democrats will find themselves in dire straits indeed. Kerry may win this time, but that will be an anomaly in some respects, handed him by the war in Iraq. All the sociological studies that I see point irreversibly to a conservative future. Remember my longstanding teaching on history: History is fractal, not cyclical. It never repeats itself, but it echoes. The only other thing I'll mention before signing off for the day is that I always lie to poll takers, and always tell them the opposite of how I intend to or did vote. I do this because I hate polls and want them out of the American political system, and if enough people lied to pollsters, polls would begin being wrong most of the time, and (one would hope) people would stop believing in them and ultimately stop creating them. Polls matter little in toss-up races like today's, but when a race is more easily foreseen, polls discourage the opposition from coming out, and thus influence the race. This is yet another corruption of the democratic process that needs to be halted. So when somebody asks you how you voted today, lie to his or her ugly faceyou will be doing America a big favor! I don't like to talk about politics much, but with the election tomorrow nobody else is talking about anything but, so I suppose I should fall in line. I think I know why recent political discussions have gotten so vicious, and while I've reflected on this issue a time or two, I don't remember where, so I'll recap briefly: It's because we are rapidly setting aside democracy for a strange sort of distributed monarchy invested in the courts. Our courts have actually been quite liberal in most respects, at least since the mid-1960s, so I think it's fair to say that the conservative government being screamed about on the left is mostly an illusion. The courts are selected by presidents and validated by the Senate, so the presidential race (and to a lesser extent the Senate races) are really what matters. It's pretty sad how completely impotent the House has become. Liberals recognize that they're losing the electorate, bit by little bit, so the only way to keep their power over the American system is to hang onto the courts. That's basically why things are so hateful. They know the only way to keep the courts is to keep Bush out of the White House (difficult) or obstruct all his appointees via filibusterwhich is a two-edged sword, since the Dems are smart enough to know that they taught the GOP how to filibuster any potential Kerry appointments, and have an intuition that certain actions, like blocking Miguel Estrada's appointment to a federal appeals court, have been noticed by Hispanics and have cost them some votes. There have been no Supreme Court openings since 1994, which I think is a record or close to it, and this streak won't last forever. Liberals want Kerry to pick the next few candidates, so that they can smear the GOP for blocking them. If Bush wins, they know that the GOP will be very quick to tar the Dems for doing what the Dems have been doing (for the lower courts) for four years now. The Supreme Court needs a little more accountability. I suggest giving each justice a single 12-year term, staggered so that one justice is retired every four years. Each presential term would thus get a chance to place at least one justice on the court, and if we can't nuke the filibuster entirely (which we should) we should protect confirmation votes from filibusters. Part of our problem with judicial activism is that judges face no consequences for being overturned. Judges who have an axe to grind (think Ninth Court) can do any damned thing they want, and if they get overturned, well, they'll try again later. I think that a single justice should get a limited number of reversals before being required to step down. How's this for a formula: "Three in a year; ten in a career." We need to implement some mechanism for getting important things out of committee. I'm not sure precisely what to do here, but my gut suggests that it should take votes from both parties to bottle something up in committee. If all votes are on one side, the bill gets out. I'm sure we could do other things, like eating all the lawyers or selling Teddy Kennedy for the poor, but the ones in my list are the biggies. And so that's all the politics for today. The gamblers are betting that Bush will win, but in truth it will indeed be a tossup, and if you think things are hateful now, just wait until Wednesday morning, when the lawsuits begin.